A Swiss NGO went public this week with allegations that the family of prominent Malaysian Taib Mahmud had laundered $30 million through an obscure Australian company called Sitehost Pty Ltd. Sitehost owns and operates the Adelaide Hilton. There is a sea of black money swishing about in Australian property markets – with a blind eye conveniently turned by our elected representatives and the bureaucracy – but the Taib case is special. Taib Mahmud is no ordinary Malaysian. He was chief minister of Sarawak province in Malaysia for 30 years, during which time nearly 90 per cent of the primary rain forest has been logged and its locals swept from their homes. One of Taib’s many roles has been Sarawak’s head of resource planning and environment. 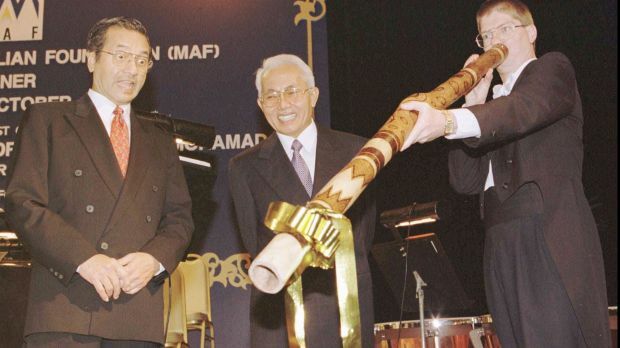 Sarawak chief minister Taib Mahmud (far left) in 1996. Taib has been chief minister of Sarawak province for 30 years. Former British PM Gordon Brown has described the destruction of Sarawak as “probably the biggest environmental crime of our times”. As for Taib, here is a man whose official salary has been a tad over $200,000 but whose family members have amassed holdings in 400 companies across 25 countries. One of these holdings is Sitehost. Taib’s daughter Jamilah Taib and her husband Sean Murray are directors. Jamilah is also incidentally Canada’s richest woman and resides in the second most expensive house in Ottawa. The Taib family bought $9.5 million worth of shares in Sitehost in 1993 and since then Sitehost has received $20.75 million in loans from a mysterious Victorian company Golborne Pty Ltd, before the loan was transferred to a mysterious Queensland company Fordland Pty Ltd.
It’s very likely, says the Swiss NGO Bruno Manser, that the ultimate controllers of these companies are members of the Taib family. There is a shadow structure on the Isle of Man and, further, there is mention of related party transactions in the financial reports that Sitehost has bothered to file. It is in repeated breach of its disclosure obligations under the Corporations Act but has not been pursued. Besides the Taib family, there are two Australian directors of Sitehost: Gary Doherty, a Western Sydney property developer and partner in law firm Low Doherty & Stratford, and Adelaide lawyer and contemporary of Taib at Adelaide University, John Kiosoglous. Both Doherty and Kiosoglous have told the media this week that they are not aware of the ultimate source of the loans to Sitehost, the beneficial owners of Golborne and Fordland that is. Perhaps the corporate regulator could ask the two directors to find out where the $20 million in unsecured loans to Sitehost comes from, as they are directors and ought to be able to find out. But that may be asking too much. We put questions to ASIC this week as to why this Taib-controlled company Sitehost had not filed accounts last year, why it’s latest accounts in 2011 were filed a year late and why there were no accounts at all filed from 1998 to 2006, in clear contravention of the laws of the Commonwealth. Rather than accepting that it was asleep on the job, the watchdog attempted to lay the blame at the feet of AUSTRAC, which is the money-laundering regulator. Second in ASIC’s line of blame were directors. 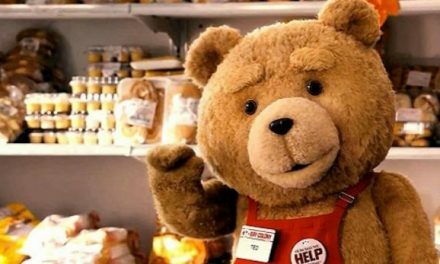 It was the duty of directors, we were told, to meet their disclosure obligations. It was only after persistent inquiries that the regulator agreed that it did in fact have powers of enforcement, that obeying the law was not a voluntary thing like going on a diet, or attending yoga class. What would it do then? Would it do anything about these flagrant breaches by Sitehost? No comment, naturally. Neither was AUSTRAC forthcoming with a statement of intent, even though demands to freeze assets and so forth had been tabled in South Australian parliament. There is no indication that any regulator will do anything about the Taib allegations. At a lunch last year, ASIC chairman Greg Medcraft described Australia as a “bit of a paradise” for white collar criminals. Medcraft had made the grave error of telling the truth while in public office and soon received a phone call from Finance Minister Mathias Cormann upon which he recanted, amending his statement with subjunctives … would be … if . We put this same proposition to Austrac this week. The chief executive had shot off on holiday between the time the questions were put and the answers returned but this was the response from a spokesperson: “Australia is not a ‘paradise for money launderers”. Call us old fashioned but this looks like a dead-ringer for a money launderers’ paradise. They don’t even have to obey the law, what more could they wish for … taxpayer-funded bodyguards on legal aid? 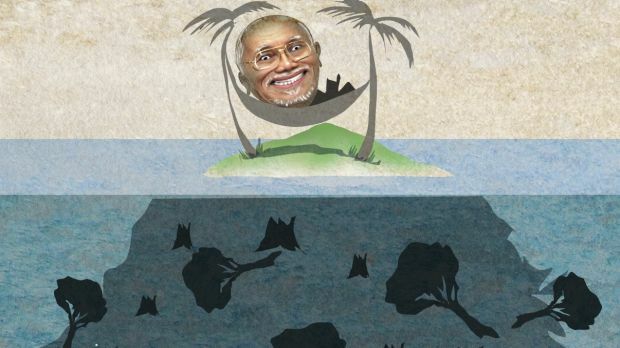 It would appear the Taib allegations are merely the tip of Australia’s money-laundering iceberg. Billions in illicit money from China pours into the property market, and real estate agents – along with lawyers and accountants – have remained exempt from the very money-laundering legislation the government promised to introduce almost ten years ago.